Maybe it’s because I don’t support a big club, but I look at SD Eibar and I like what I see. It’s small, well run, part of the community, yet still prepared to mix it with the larger clubs and bruise a few egos along the way. 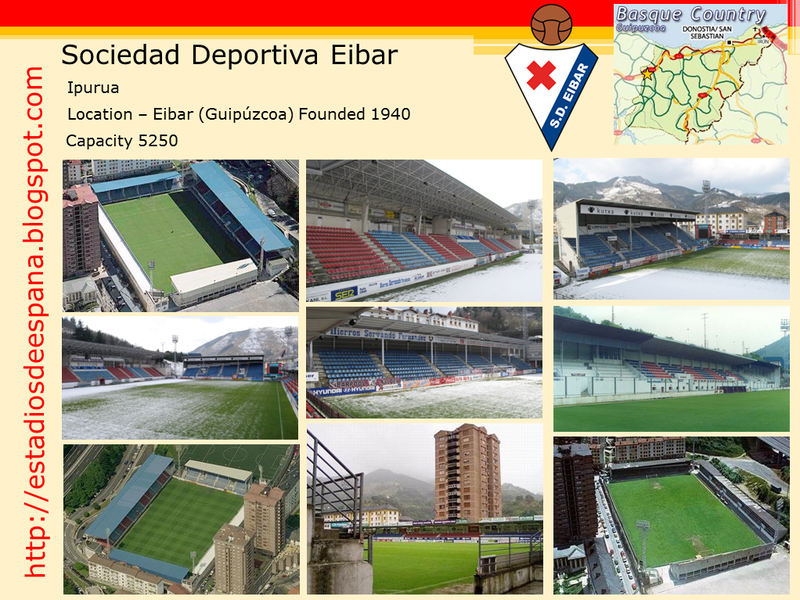 Eibar is in the west of Guipuzcoa, on the border with Vizcaya and 25 miles from Bilbao and San Sebastian. It used to be a player in the Spanish steel industry and was renowned for the quality of its handguns & bicycles. However the furnaces & the firearms have long been silent, whilst the wheels fell off the local bicycle trade many moons ago. 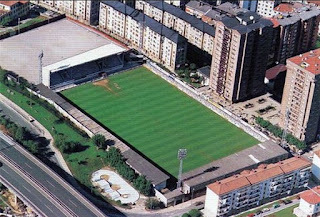 At its peak in the 1970’s, Eibar had a population of nearly 40,000. Today that figure is nearer 27,000. 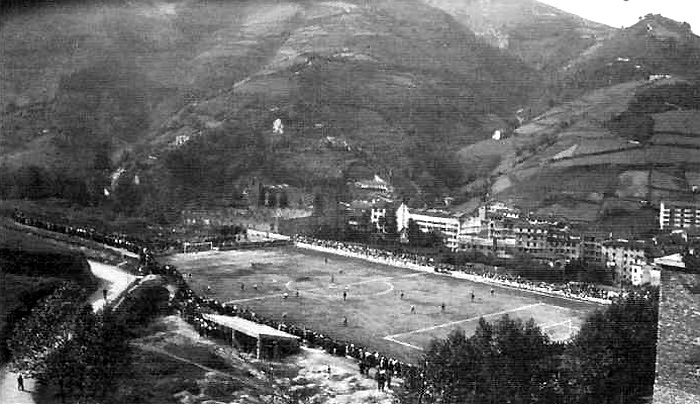 In 1940, Deportivo Gallo and Unión Deportiva Eibarresa joined forces to form Sociedad Deportiva Eibar. Their first home was the Campo de Lerum, 5 miles to the north west in Elgoibar, before moving to the Campo de Erdikua in 1943. 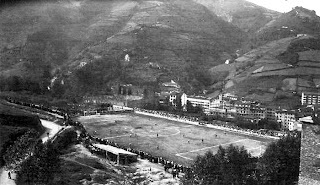 Eibar moved to the present site of Ipurua in 1947. Work began on the central main stand in 1948 and this was finally opened in 1951. Two Tercera titles were won in the early 1950's, before promotion to La Segunda was earned in 1953. 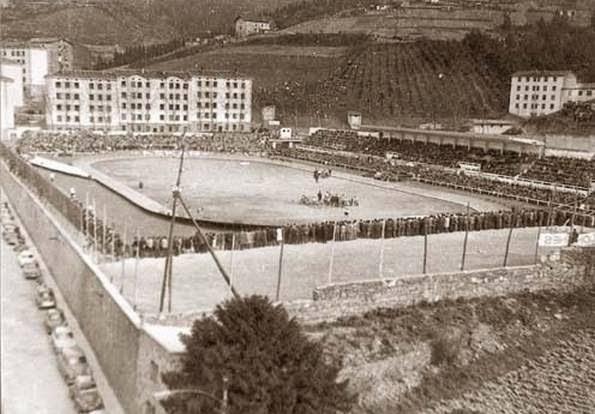 The second division was a regional competition back then, and Eibar hung around the northern section for the next five seasons, finishing as high as 7th in 1954. The club dropped back to the Tercera in 1958, and it would take another 30 years before it would return to the second tier. Because their Ipurua home lies at the bottom of a steep valley, the pitch was prone to flooding and poor drainage. Steps were taken to address this and a new drainage system and pitch leveling was completed in 1959. The ground remained relatively basic throughout the 1960’s, although it did sport a temporary cycle track when a stage of the Vuelta a España finished in the town in 1963. In 1970 the popular east end was covered and the roof of the main stand was extended. The first floodlights were also installed in 1970, and they were officially inaugurated on 14 October with a match between Eibar's equidistant rivals, Real Sociedad and Athletic Club de Bilbao. 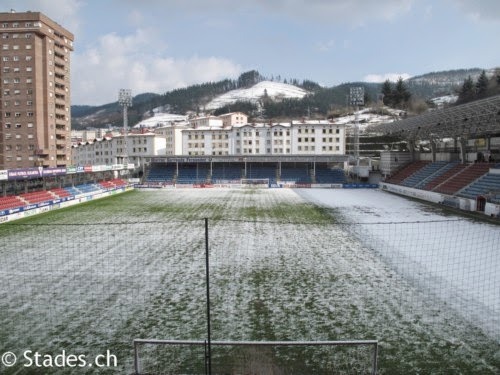 During the 1980’s Eibar’s fortunes improved on the field and basic improvements were made to the ground. This included the erection of a basic cover at the western end of the ground. In 1988 Eibar reached Liga Adelente, but Ipurua was probably the most basic stadium in the division. Matters were complicated by the fact that the urban area of the town had spread westwards and severely restricted space to the north of the ground. Eibar's efforts in La Segunda during the nineties were impressive, finishing as high as fifth in 94/95 & 96/97. Even when struggling, Eibar did not give up the fight. With five games to go in the 98-99 season, the club was adrift at the foot of the table, eleven points behind 18th placed Mallorca B. Incredibly, Eibar won its final five games and finished a point ahead of Mallorca, thus retaining their place in the second division. 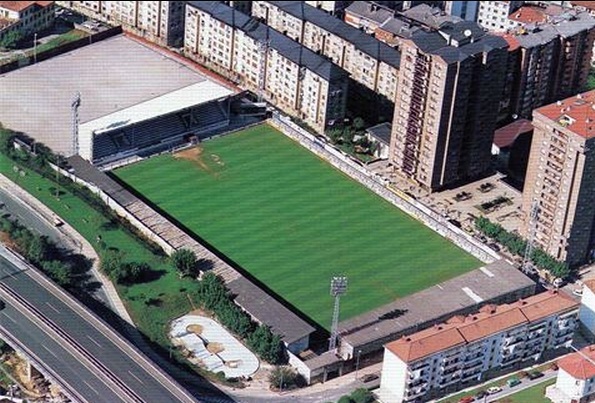 In 1998, the club received funding from the local council and ‘Liga de Fútbol Professional’ and started a project to completely remodel Ipurua. The original main stand was demolished and a new, full-length covered stand was constructed. This had a capacity of approximately 2,800, which would be over half of remodeled ground's capacity. In 1999, work started on refurbishing the end stands and finally in 2001, the narrow north terrace was roofed and 4 rows of seats were installed. Work was completed with the installation of a new drainage system and pitch.Today, Ipurua is a modern, if somewhat compact stadium and has a fully seated capacity of 5,250. 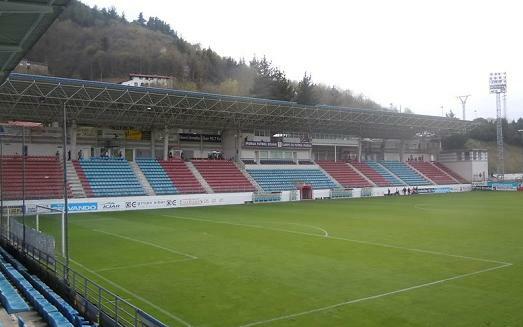 Between 1988 and 2009, Eibar spent all but one season in La Segunda, achieving a high of fourth in 2004-05. They returned to Segunda B in 2009, clocking-up a series of top 3 finishes. Unfortunately, the play-offs proved to be their Achilles Heel, losing in three successive seasons before finally winning promotion back to the second tier in June 2013. 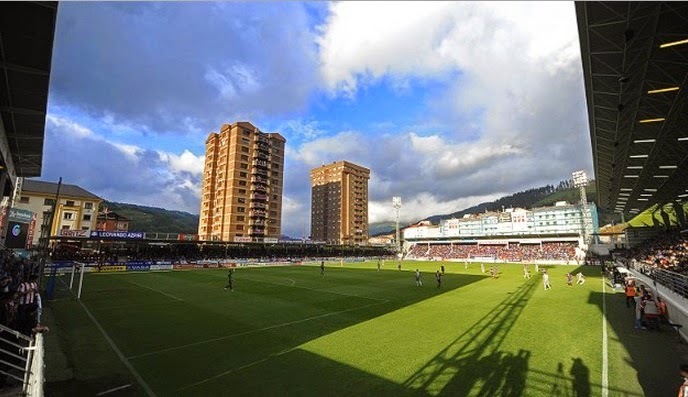 Despite having the smallest budget in La Segunda, Eibar confounded the experts by holding a top three position throughout the 2013-14 season. Then with two games of the season remaining, the club achieved the unthinkable, promotion to La Primera. There was the small matter of the LFP's ludicrous financial requirements, that required debt-free Eibar to raise extra capital to meet La Liga's thresholds (explained here in Sid Lowe's article). With the wider football family wanting a fairy-tale ending, Eibar raised the necessary capital with time to spare. The club will be given two seasons to meet the top tier’s minimum stadium capacity requirement of 12,000. To be honest, financial ability aside, Ipurua offers little scope for redevelopment due to its enclosed environs. Work will start shortly on expanding the shallow stand that runs along the northern side of the ground. This will raise the capacity by 1000 seats, but quite where they will find the space for another 5750 seats is anybody’s guess. 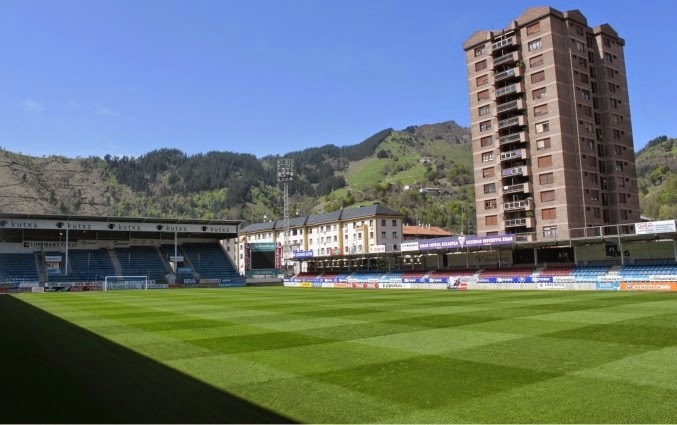 So does Eibar’s future lay away Ipurua? Whilst the LFP is likely to be unyielding in its requirements, a new stadium would be an unnecessary extravagance. The club, which has average crowds of 3,000, neither needs nor can afford a new home. Of course, none of this will be necessary if their top-flight odyssey ends before September 2016. However, that is not the point. Eibar has earned its place in La Primera and shown that you don't have to sell your soul to do so.